(AP) -- Panasonic Corp. is investing $30 million in Tesla Motors Inc., the U.S. maker of electric sports cars, eyeing expansion in the global market for green vehicles, both sides said Thursday. Panasonic, Japan's biggest electronics maker, will acquire about a 2 percent stake in Tesla, purchasing Tesla common stock at $21.15 per share. Panasonic, which already makes batteries for Tesla vehicles, said the two firms will jointly market and sell battery packs for electric cars. Shares in Panasonic jumped 3.7 percent to 1,181 yen Thursday following the announcement of the capital tie-up with Tesla. Apart from Panasonic, Toyota Motor Corp. already has invested $50 million in the high-end electric car maker. Toyota, the world's No. 1 automaker, has also signed a $60 million contract to have Tesla help develop an electric version of Toyota's RAV4 crossover vehicle. "It is an honor and a powerful endorsement of our technology that Panasonic, the world's leading battery-cell manufacturer, would choose to invest in and partner with Tesla," said Tesla Chief Executive Elon Musk. "We believe our partnership with them will enable us to further improve our battery pack while reducing cost." 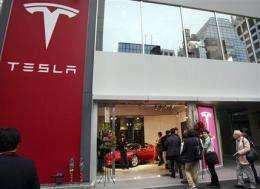 Tesla opened its first Asian showroom in a fashionable Tokyo neighborhood last month, hoping to woo rich buyers before eventually widening its appeal with cheaper models. But the company has not turned a profit since it was founded in 2003, and so far Tesla has sold only about 1,000 of its high-end electric cars. It currently sells just one vehicle, the $109,000 Roadster sports car, which is popular among celebrities and performance-car enthusiasts. But interest is high in Tesla because of growing concerns about global warming and pollution. Governments around the world are offering tax rebates and incentives for electric car buyers, and they also won't need to ever fill up at a gas station. Nissan Motor Co., which is bullish on electric vehicles with its Leaf set for delivery in December, expect such vehicles to grow to 10 percent of overall global sales by 2020 but other research puts the number lower. Current sales of electric cars are negligible. Naoto Noguchi, President of Panasonic's battery cell unit, said the company hopes to build its reputation as a green company. Last month, Tesla showed a retooled factory in Fremont, California, the site of the former joint venture between Toyota and General Motors Co., where it plans to produce its next-generation electric sedan, the Model S, in partnership with Toyota, set to start in 2012. I wonder if this will allow Tesla to make a production plant that can churn out the roadsters for an affordable price. I might be able to come up with about 50K if I saved up a few years... maybe..